"Soaring Like an Eagle Into New Heavens of Valor and Devotion"
Less than a week after his death, friends and fellow University of Virginia alumni began urging the University to erect a fitting memorial to James R. McConnell. Edwin A. Alderman, President of the University of Virginia, supported the move to memorialize McConnell on the Grounds of the University and was intimately involved throughout the process of selection, design, creation, and installation of the statue. The artist who received the prized commission was Gutzon Borglum, sculptor of Mt. Rushmore and Stone Mountain. 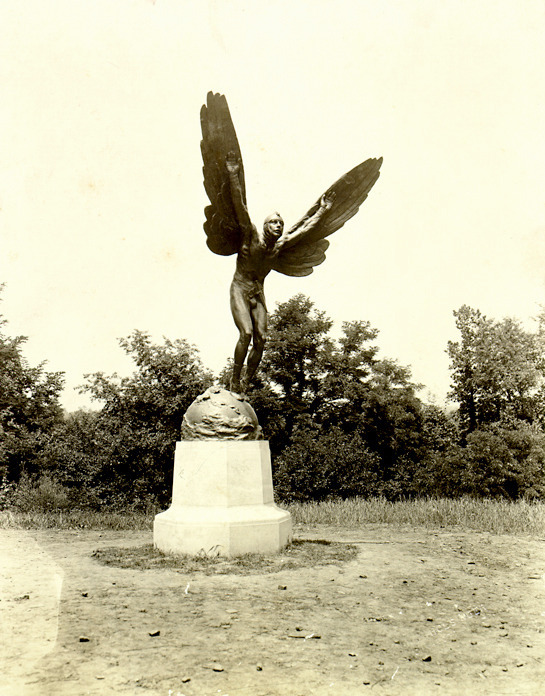 The following pages narrate the history of "The Aviator", the statue commissioned by the University, and display some of the artifacts related to McConnell in the Special Collections Department.